Simon Pulse/Beyond Words, 9781582704647, 240pp. At age eleven, Jessica Markowitz learned that girls in Rwanda are often not allowed to attend school, and Richards Rwanda took shape. During his sophomore year of high school, Zach Steinfeld put his love of baking to good use and started the Baking for Breast Cancer Club. Do you wish you could make a difference in your community or even the world? Are you one of the millions of high school teens with a service-learning requirement? Either way, Be a Changemaker will empower you with the confidence and knowledge you need to affect real change. You’ll find all the tools you need right here—through engaging youth profiles, step-by-step exercises, and practical tips, you can start making a difference today. This inspiring guide will teach you how to research ideas, build a team, recruit supportive adults, fundraise, host events, work the media, and, most importantly, create lasting positive change. Apply lessons from the business world to problems that need solving and become a savvy activist with valuable skills that will benefit you for a lifetime! Laurie Ann Thompson cofounded a successful Internet start-up with her husband during the technology boom. She has volunteered with Youth Venture, an organization that supports teens with big ideas, and she makes time for other volunteer opportunities as they arise. Thompson has more than twenty-five published articles in Faces, Know, Kono, WeeOnes, ParentMap, and more. Visit her at LaurieThompson.com. "Teens looking to make a difference will find inspiration as well as real-world strategies for realizing their dreams of being the change they want to see in the world." "This book is packed with practical advice and inspiration for anyone who has a yearning to build a better world." 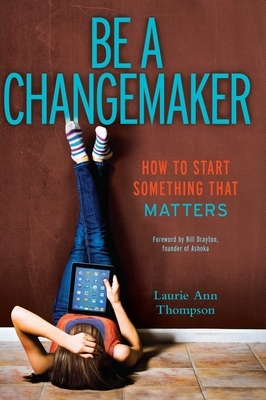 "[Be a Changemaker] is a book that forces readers to not only think realistically but also to think big." "Socially aware teens are not content to sit idly by and watch the world fail to solve problems. They want to be out there helping and reshaping the world. Savvy librarians will match this book with those teens and get them jumpstarted on their path." "From discovering potential causes and passions to creating business plans, soliciting donations, and being aware of legal and financial pitfalls, Thompson offers thorough, encouraging advice for the next generation of activists. "There’s no time when we most want to change the world than in our youth years. Laurie Ann Thompson speaks clearly to young people who want to make a difference in their surroundings, doing their part to make the world a better place. Thompson explains that no matter how small a good idea may seem, it may be just a tiny seed for something that will grow and affect other people’s lives in a positive way."